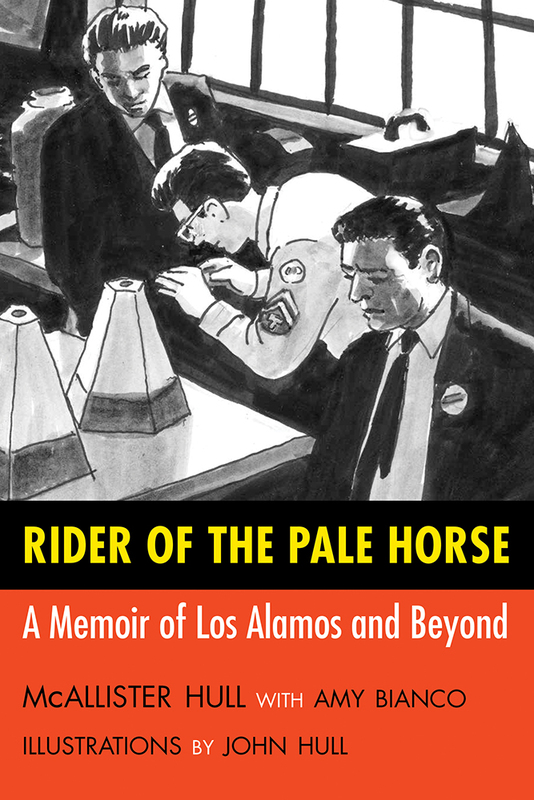 A scientist’s recollection of his life as a junior member of the Manhattan Project, Rider of the Pale Horse recounts McAllister Hull’s involvement in various nuclear-related enterprises during and after World War II. Fresh from a summer job working with explosives in the chemistry department of an ordnance plant, Hull was drafted in 1943, after his freshman year in college. Unlike other accounts written by scientists and historians of that era, Hull’s narrative offers a realistic picture of the dangerous and messy job that GIs and civilian powdermen were asked to do. Hull’s description of his postwar work supporting the Bikini Atoll tests in the Pacific and the early concerns about the effects of a hydrogen bomb explosion illuminate the Dark Age of nuclear weaponry. John Hull’s illustrations show technicians and scientists at work and bring the story to life. McAllister Hull (1923–2011) was a professor emeritus of physics at the University of New Mexico, where he served as provost in the early 1980s. John Hull teaches in the College of Charleston Department of Studio Art in South Carolina.